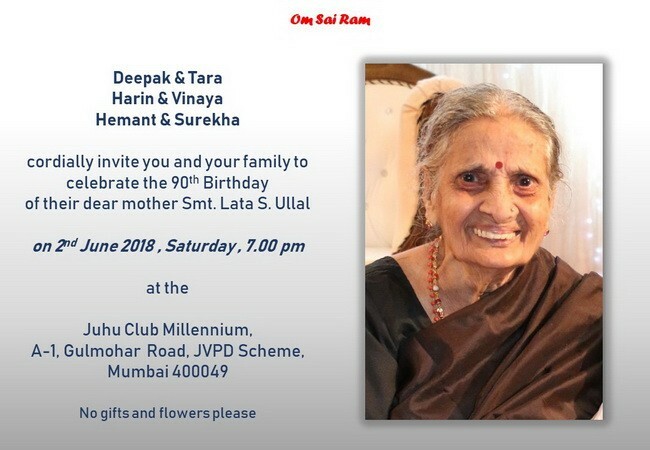 Mumbai: Mrs. Lata S. Ullal recently celebrated her 90th birthday on 6th June 2018. She must, by far, be the oldest living Devadiga in Mumbai. She is the wife of Late. Shrinivas Ullal, who as GM of a Mill has provided employment to many devadigas in Mumbai. He was a noble soul and Mrs. Lata Ullal encouraged her husband to bring many people from Mangalore to Mumbai and provide them jobs. Shri. Deepak Ullal is her son.